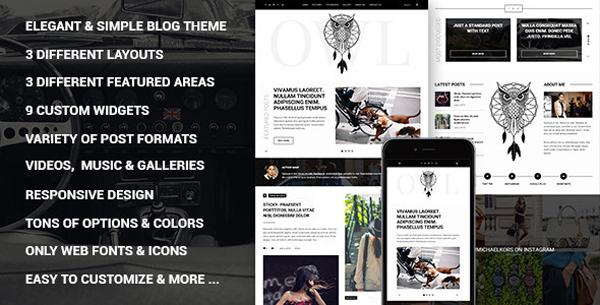 Owl is Beautiful and Clean WordPress blog theme for people who wants to share their stuff. Theme is designed considering all the details to attract users’ attention. Now you have the power to customize your blog with just a click of the mouse. Owl Theme delights visually and functionally, tons of options and unlimited colors. 3 Different Layouts, 3 Different sliders in Featured Posts Area, 3 Custom Gallery Types, 2 Kinds of pagination, 9 Widgets + MailChimp widget skin is only the beginning of the features list.